I am looking to add funds to my Industrials sector holdings. Even though the market index is approaching new highs, I do believe it is a market of stocks and there are good values out there if one looks hard enough. From my survey of dividend growth stocks, I have narrowed down my focus to these two picks. Union pacific has promising growth. Their share price has pulled back recently, making them approach fair value according to its average PE over the last 10, 13, or 15 year period. I believe there might be a better entry point but the shares are already at fair value and I will be willing to start averaging into this company. UNP has 9 years of dividend increases. Value Line rates this company 1 for safety and A++ for financials. CAGR with dividends reinvested over the last 15 yrs averages 18.1% annually. 3M is the other company I am interested in. The recent pullback from revenue declines due to the strong dollar has started to send shares back down. 3M is still fully valued in my opinion and should come down more. 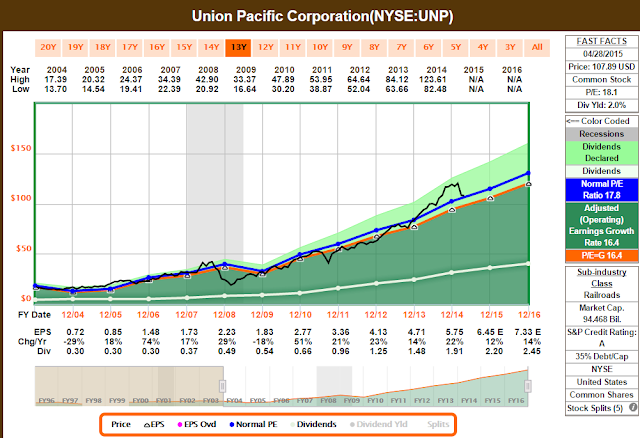 I am willing to pay more for 3M than UNP since I feel more comfortable holding 3M over the long run. 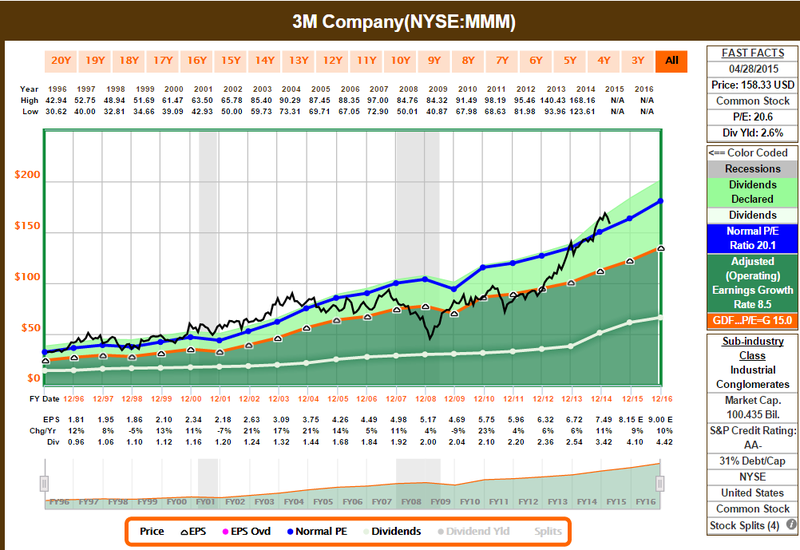 3M has the impressive 57 year dividend increase streak to back itself up. Value Line rates 3M as a 1 in safety and A++ in financials. The 15 year CAGR of 3M is 10.0% with dividends reinvested which is less than UNP but impressive for a blue chip. The stock pullback isn't something to get excited over as it's quite small, and waiting may bear one more reward. I will be really interested in 3M at values below $150. My time horizon is over 30-40 years so I am not as picky at timing my entry points.